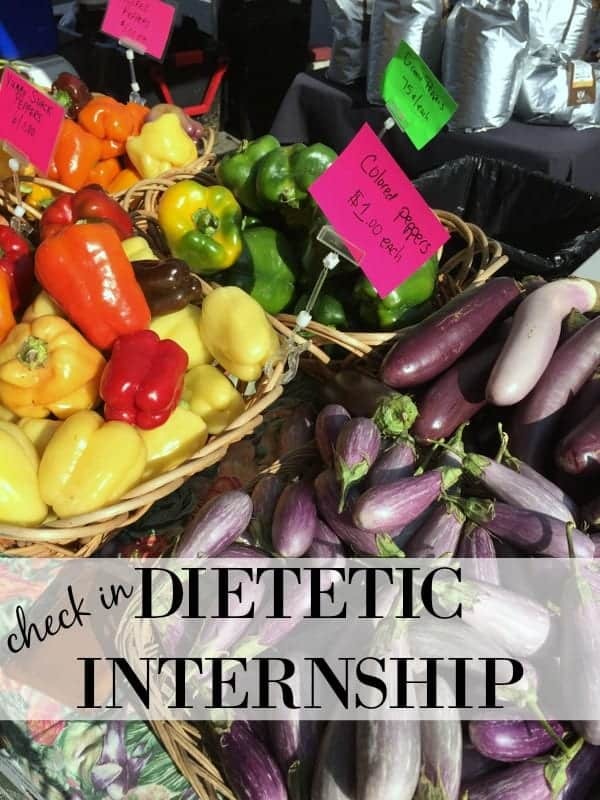 I’ve mentioned my Dietetic Internship periodically, but I haven’t dedicated an update or post to my internship or journey to becoming a registered dietitian nutritionist in quite some time! It’s been 9 months since I started the practical training of becoming an RDN – so I thought now would be a good time to check in with you in regards to what I have been up to! Over the past 9 months, I completed rotations in community, food service, clinical and management settings. I still have 3 more months left in the internship, but I can absolutely tell a difference between NOW and when I first started. I actually have confidence to make judgement calls, realize that constant research is part of the job, and LOVE the challenge of learning new things all the time. My first rotation was in the “community” category. I complete most of my hours over the summer, and then had two mini rotations with the same preceptor in this area (my final 60 hours being the next two weeks!). Working with The Marion County Health Department was really great because of the VARIETY of experiences I was able to achieve. Provided ideas and education to individuals at food pantries and receiving commodity food boxes with ways they could use the items in their boxes to create recipes and meals. Shadowed at WIC clinics (clinics that assist Women Infants and Children). Attended city-wide meetings to help decrease food insecurity in Marion County and Indianapolis. As you can see we really did a ton during this rotation. I really enjoyed the variety and getting out into the community to meet individuals where they are currently at. 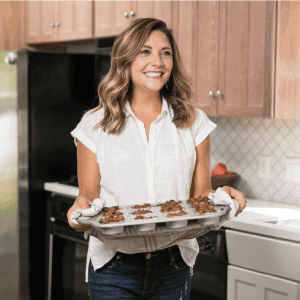 This experience was very grounding and a great reality check that for many individuals it’s not all about kale chips and green smoothies – it’s a matter of getting food on the table. My next rotation after completing many community hours was Food Service. The majority of my hours were completed in a school system, but I also completed hours with the Indiana Department of Education and CICOA Aging & In Home Solutions. I really had no idea what to expect here, but my how school lunch has changed since I was in school (and for the better!). There are always fresh fruits and vegetables available, students (even young elementary school-aged students) are able to PICK which fruit and vegetable sides (and even their entree) they want to eat, and the individuals working to create the menus are constantly trying new ways to incorporate interesting flavors and more nutritious options. 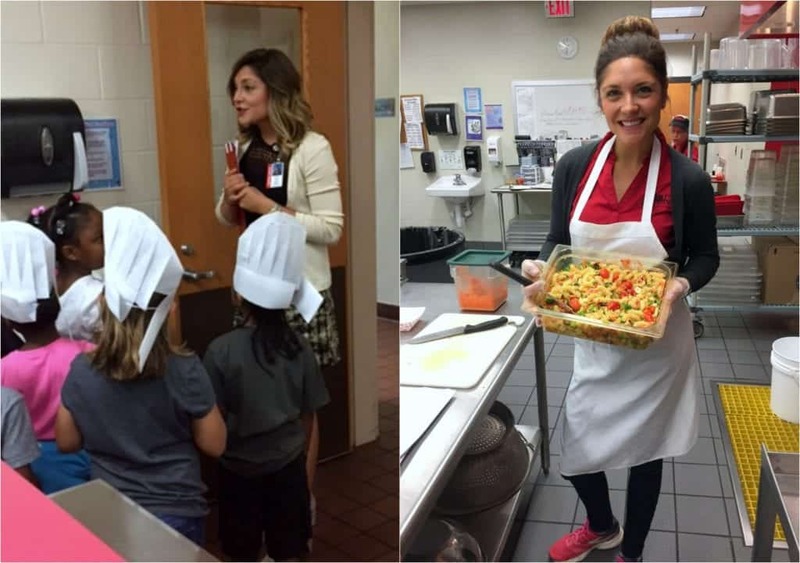 Updated informational fact sheets on the Indiana Department of Education web site regarding the various nutrition programs they offer. Surveyed individuals receiving home delivered meals from CICOA to compare their eating habits (fruit and vegetable consumption, number of meals consumed per day, etc) NOW to before they were receiving the home delivered meals. While I worked in the food service industry for many years (I worked at Fazoli’s in high school and was a server during college) at the time, I honestly never thought about the “nutrition” aspect involved in creating the menus and educating/marketing to the public. I loved this rotation much more than I expected to! I don’t have a picture from any of these rotations! That being said I really did enjoy my time learning in a variety of clinical settings. When thinking about the clinical component, prior to my rotation experience I was SO nervous. I had no idea what to expect! All I knew was that I had minimal hospital experience, feel queasy around blood/pain/discomfort, and didn’t want to seem like I had zero clue about anything nutrition. My preceptors were all SO wonderful – they challenged me to really think through various processes to truly gain an understanding of how various disease states and mechanisms worked. This in itself was HUGE – I loved learning to think in this way, and I will continue to think through problems, case studies, and patient scenarios in this way to make sure I really see things from all perspectives. I completed rotation hours at IU Health University Hospital, in long-term care facilities (I went to several), and St. Vincent Bariatric Center of Excellence. Again – huge variety here, but the common denominator was meeting the patients/clients where they were at in their journey. I’ve only completed 100 out of 300 hours needed to complete my Management rotation (which is a concentration I selected). This initial 100 hours was completed at a place very near and dear to my heart…Butler University! While attending Butler University as an Arts Administration and Music major – I spent a TON of time in the Health and Recreation Center. I taught group fitness classes and participated in many of the classes and fitness activities there too! It was really special to be able to go back to the place where I learned so much about healthy living. 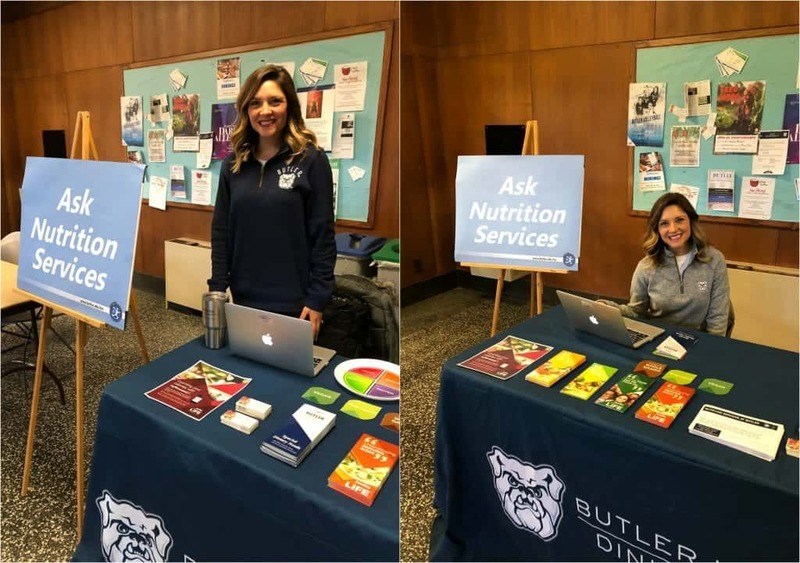 “Ask Nutrition Services” table events where I passed out samples, recipes that college students could make in their dorms/apartments/Greek houses and answered any questions they had about nutrition. Worked with the “budget” to figure out what it would cost to update a certain part of the facility to be used for more nutrition events and to bring on a full time Registered Dietitian Nutritionist. Brainstormed and created a marketing plan for nutrition services. Worked with student groups promoting healthy living on campus. Met with students who had nutrition questions to help them sift through the world of information to figure out what they were truly looking for. It was a really great first exposure to this type of experience and I am SO looking forward to my remaining management rotations in the next three months. Let me know if you have any questions about the internship process, or anything else I have going on! I’m always happy to share! 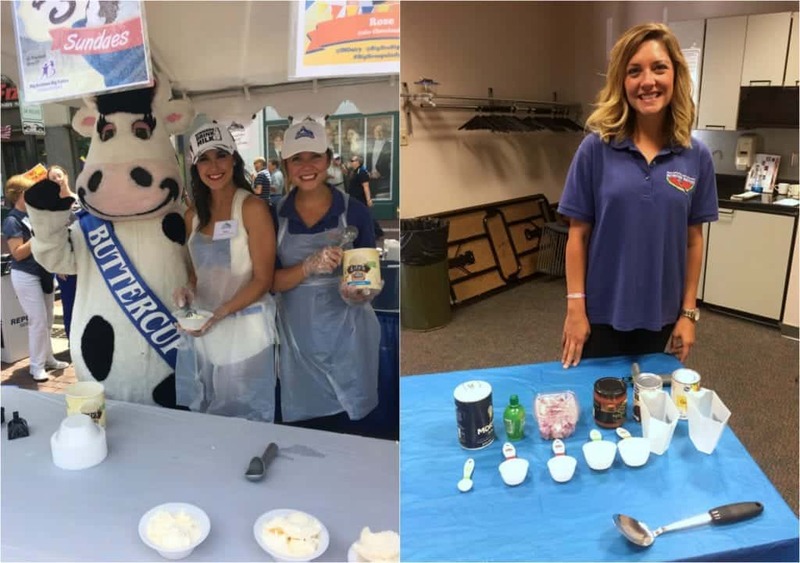 Congratulations on all you have accomplished in your internship! You are definitely in the home stretch now – good luck to you on your exam in August! Thank you so much, Jessica!! 🙂 I need all the luck and support I can get! Congrats to you!!! Sounds like you’re rocking it and rocking it in my home state! Yay! Thanks so much, Sara!!!!! 🙂 Yay Indiana! It sounds like you are having such great experiences and that this has been a wonderful intership! Keep up the good work! It has been SO awesome!! Thanks for the support!